LG has launched Q6, the first smartphone of the much-awaited Q series, in India. The new series will offer many premium features usually found on flagship series at an attractive price. The Q6 will feature a 18:9 wide screen, similar to the premium G6, facial recognition technology and military grade durability. 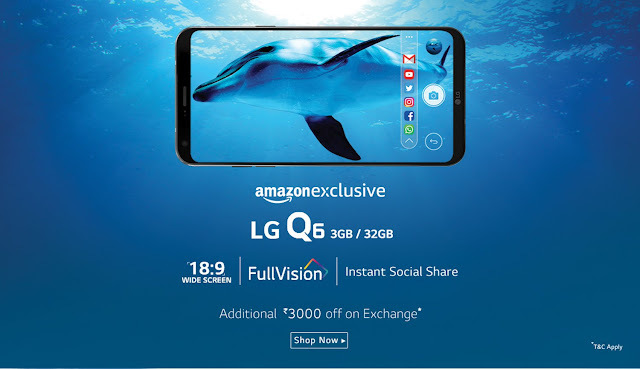 After debuting its FullVision display with the flagship G6, the company has brought the technology to the Q6, which will be the first mid-range phone with the proprietary technology. LG Q6 has a 5.5 inch FHD FullVision display, with a tall aspect ratio of 18:9. It will be powered by a Snapdragon 435 octa core chip at 1.4 GHz along with Adreno 505. Multitasking will be taken care of by the 3 GB of RAM and internal memory capacity is 32 GB, which can be expanded up to 2 TB via microSD, which has a dedicated slot. Dual nano SIM, with support for VoLTE, Wi-Fi 802.11b/g/n, Bluetooth 4.2, microUSB Type-B with OTG support take care of connectivity. Sensors such as proximity, ambient Light, accelerometer, compass and gyroscope are included. The fingerprint scanner has been omitted and the Q6 will be protected by proprietary Face Recognition technology and Knock Code. 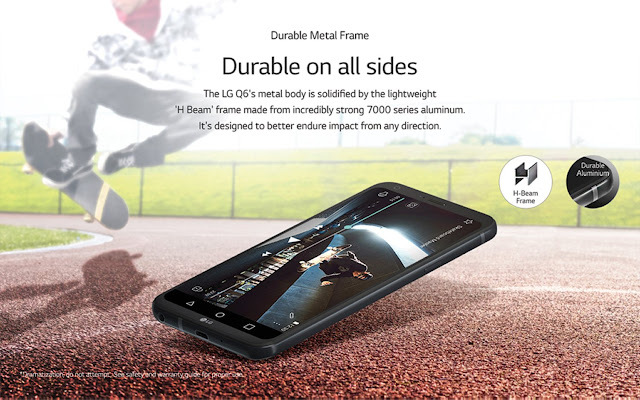 The company touted about the smartphone's durability, which is enhanced by the use of 7000 series aluminium as the metal frame. With an exterior dimension of 142.5 x 69.3 x 8.1 mm, the phone weighs 149 g.
The rear camera has a 13 MP CMOS sensor and front camera has a 5 MP Wide Angle sensor. A square camera mode and an option to instantly share to social media are also included. The phone will be running on Android 7.1.1 with support for Google Assistant. The Q6 will be powered by a 3000 mAh non removable battery. The LG Q6 is priced at Rs. 14,990 and will be available in three color options - Astro Black, Ice Platinum and Terra Gold. 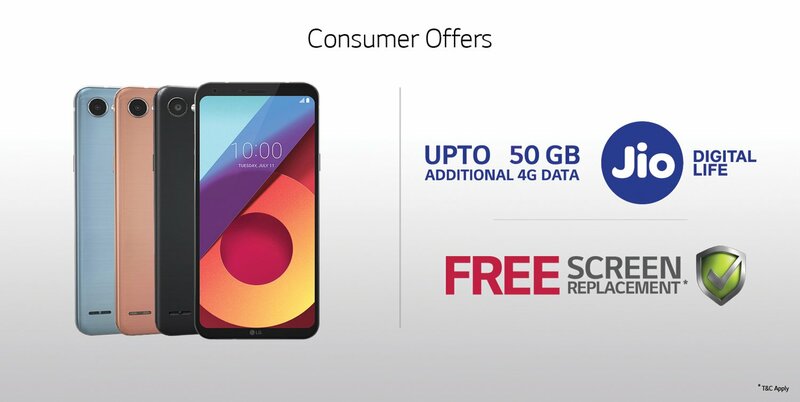 Q6 is available exclusively via Amazon India, with additional offers such as up to Rs 3000 off on exchange, 50 GB additional Jio data and free one time screen replacement (within 6 months).